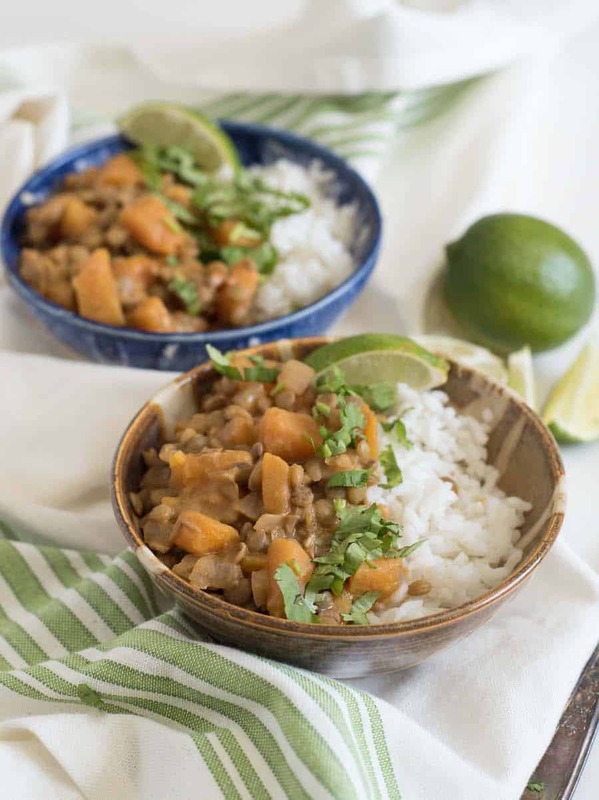 A simple lentil curry made with lentils, butternut squash, and coconut milk makes for a perfect and healthy plant-based dinner. Today I’m working with So Delicious, and I’m really really excited about it. 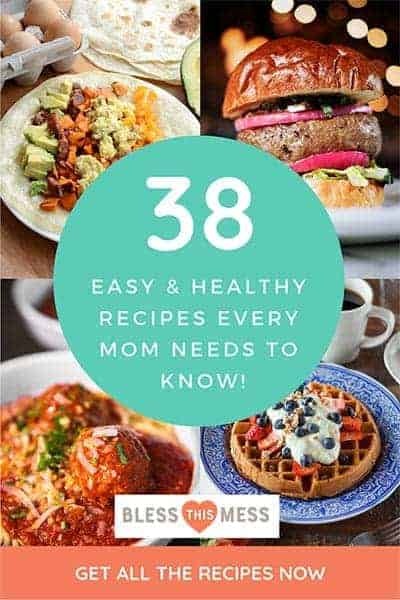 I’m really trying to center my kitchen on healthy plant-based meals that are good for my family, good for the earth, and good for my budget!I also like to keep a little running list of recipes that are good to serve to friends and family with food allergies. This recipe is dairy-free, vegan (check on the curry paste), and gluten-free (use the coconut aminos instead of soy sauce), just because of how it’s made. 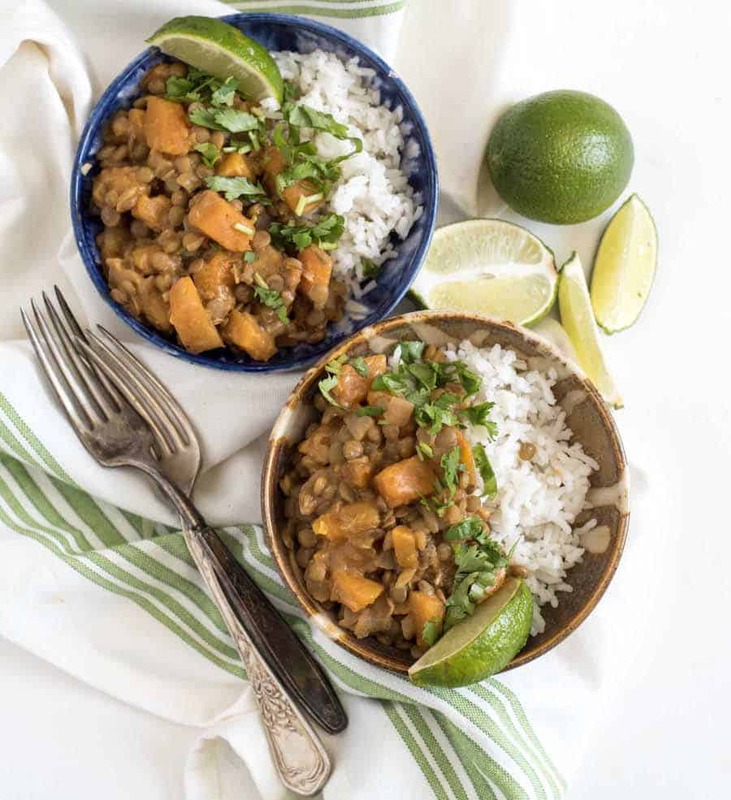 This creamy sweet and savory lentil curry with butternut squash is hearty comfort food that comes together in a snap. This is a great meal to keep in your regular rotation because it’s so simple but so full of flavor. 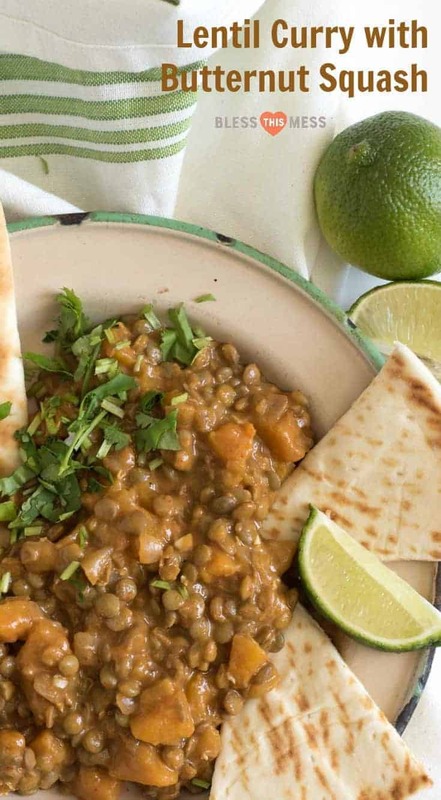 We love curry in all forms and this super simple lentil curry is always a hit. The creamy butternut squash breaks down just a bit while cooking to thicken and sweeten the sauce. Add some curry paste and creamy coconut milk, and you are just about done. Rounding out this dish with a squeeze of fresh lime and chopped fresh cilantro is exactly the finish it needs. 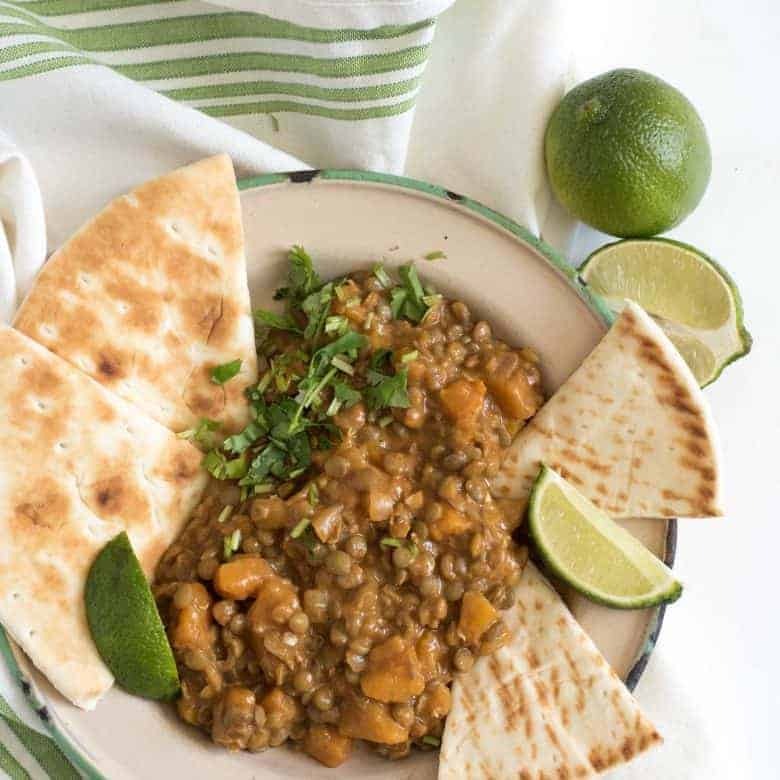 The bright flavors of lime and cilantro go so well with the warm savory flavors of the coconut milk, squash, and lentils. And here’s why you are going to love So Delicious as much as I do. From “our robust allergen-testing program to the innovative work we do creating products made with high quality ingredients, So Delicious Dairy Free is committed to doing the right things for people, animals and the planet.” I read that about their company and it really spoke to me as a person. I’m trying to do right by my people, you, animals, and the planet, too. That’s why I’m so pleased to be working with them today. Curry paste is a powerhouse of flavor without having to buy a million spices. If you are new to it, it’s time to try it out. I’d recommend red or green curry paste for this recipe. The heat in curry paste seems to vary a lot by brand so you are going to have to play with it a bit to see how much you like. I’d start with adding a smaller amount. Towards the end of the cooking time, taste a little bit. If it needs more flavor, add a little more until it’s to your liking. I really liked using So Delicious Coconut Milk for this recipes. It’s organic, comes in an easy-to-open carton, and just tastes so fresh. You can use the unsweetened coconut milk or the culinary coconut milk – both are great. The cilantro and lime for serving aren’t optional; they really brighten up this dish, and you won’t want to go without them. You can serve this curry over white rice, brown rice, cauliflower rice, or spaghetti squash, or with flatbread or pita bread on the side. It’s so versatile. I used brown lentils for this recipe. They hold their shape while cooking and you can see the individual lentils once it is finished. If you were to use red lentils, they would break down while cooking and create a thicker, more “stew-like” curry. Use what you have on hand or prefer, because both are great options. Heat a medium pan or large skillet over medium-high heat. Add the oil and onions. Cook the until the onions are translucent and tender, about 5 minutes. Add the garlic and curry paste and cook, stirring well, until the garlic is fragrant and the curry paste is well incorporated. Add the lentils, butternut squash, and coconut milk. Stir to combine. Bring the mixture to a boil, reduce heat, and simmer, stirring often, until the lentils are tender and the squash is cooked through, about 30 minutes. Add the soy sauce or coconut aminos and additional sea salt to taste. 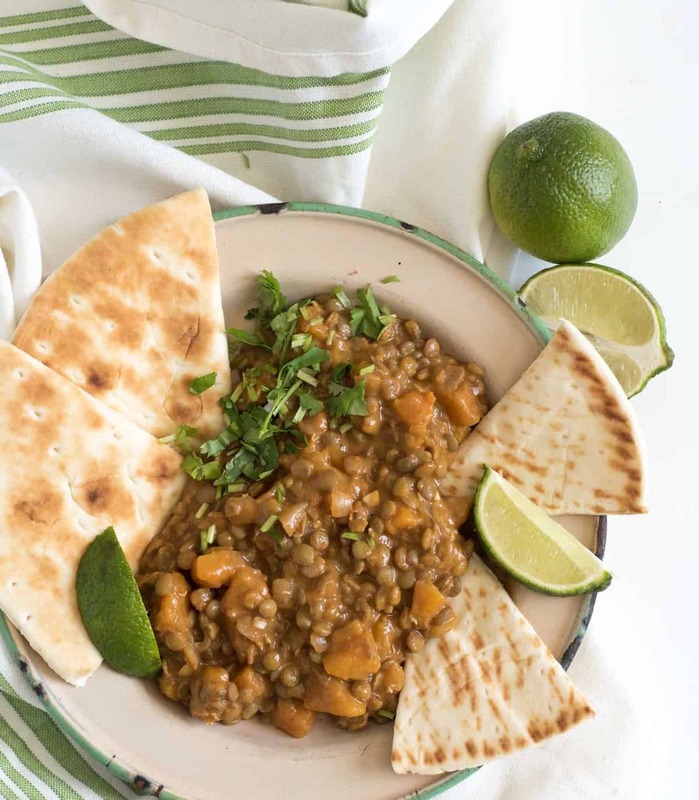 Serve hot over rice or with flatbread and garnish with fresh lime juice, chopped cilantro, and additional soy sauce or coconut aminos to taste. See the tips and tricks section in the post for lots of notes on this recipe. Are you new to So Delicious? 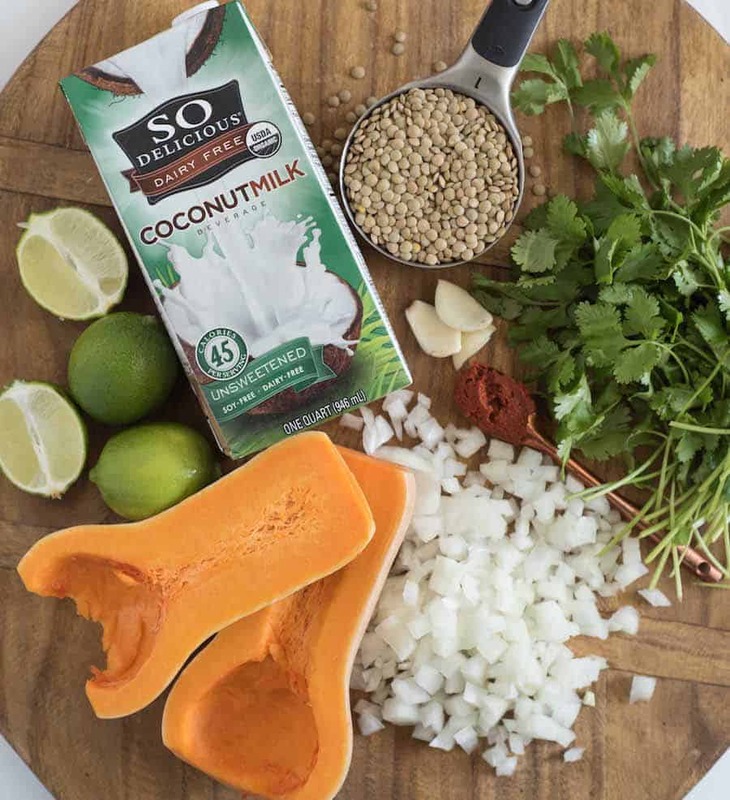 I used their unsweetened coconut milk for dishes like One Pot Coconut Chicken and Rice and Green Thai Chicken Coconut Curry, and I keep it on hand for smoothies (and I love that it is shelf stable since I have to pick it up when I go to town, which isn’t all that often). You could also use the “culinary coconut milk.” It is whiter and fresher than canned equivalents, and it’s formulated to work with recipes calling for a 14oz can. I’m going to look for culinary coconut milk next time I’m out! Happy healthy curry, from my home to yours! 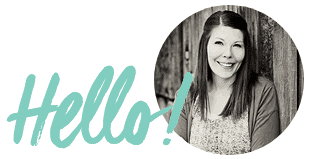 Thank you so much for supporting the brands that I thoughtfully choose to work with. Disclosure: This post is sponsored by So Delicious. I use and love this company regularly in my kitchen and all opinions are my own. Tomorrow I drive thru the big city which means I can pick up some cashew milk ice cream. It sounds yummy! I’m so glad I threw in the ice chest! Just started to get into coconut milk. I am going to have to try this recipe. Thanks. I know what I am making for dinner tonight! I just made this last night, and my boyfriend and I loved it! We had it with naan, but rice would also be excellent. Lime and cilantro are a must! We’ll definitely make this again. Thanks for a great recipe! Agree about the cilantro and lime, a must add! I’m do glad that you like it as much as we do. I just made it on Monday too and still have leftovers in the fridge for lunch! Not a winner for us. The butternut squash took a long time to cook and despite all the curry it lacked flavor. Would suggest roasting the squash to get it a bit caramelized and then just adding it to the lentil mix at the end. Love the creative use of lentils and butternut squash though. Thank you for posting!